Portrait of Socrates Maupin, no date. Socrates Maupin first came to the University as a student in 1828. Unlike many early students who stayed one or two sessions, Maupin, a dedicated student, remained to earn an M.A. degree, though he did throw at least one party. He returned to the University as Professor of Chemistry and Pharmacy in 1853. The following year he was elected Chairman of the Faculty and continued in that post until 1868, steering the University through the difficult years of war and reconstruction. 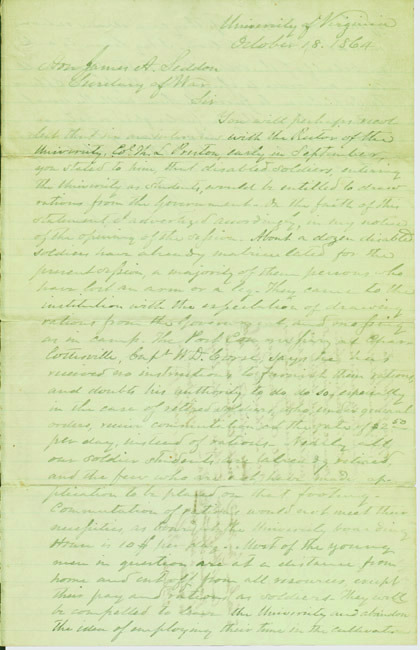 In 1864 he pleaded with Secretary of War James Seddon, himself a University graduate, for rations and retirement pay for disabled Confederate soldier students so that they might afford to stay at the University, a request which Seddon granted. 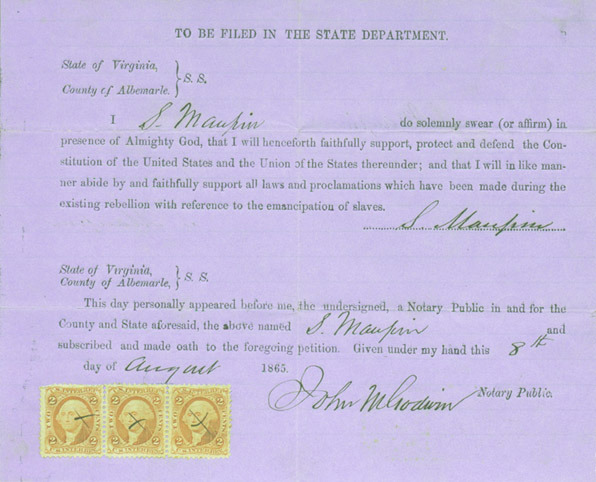 Loyalty oath signed by Socrates Maupin, 8 August 1865. 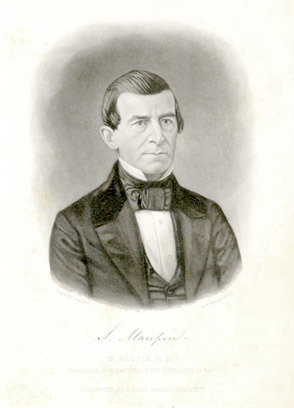 With the end of the war, Maupin quickly signed the Loyalty Oath, helped refinance the University on his own credit, and began refilling the faculty ranks, depleted by war to eight men. 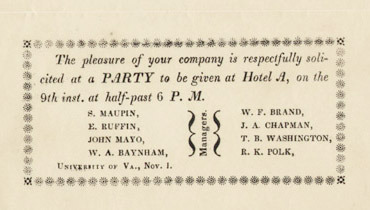 After Maupin's death in a runaway carriage accident in 1871, the faculty praised his "extraordinary aptitude for affairs, his clear perception of complex transactions, his rare sagacity and promptness of decision, [and] his varied knowledge of the practical interests of society," resolving that, "It was due largely to him that the prostration during the war was not a final and remediless blow."